Hanbok worn by BTS in its music video for “Idol” will be put on display in Seoul from this week. The hanbok exhibition will take place at the center’s outdoor square on its first floor from 10 a.m. to 7 p.m. Visitors are also able to try on hanbok of the same designs on the second floor of the building. 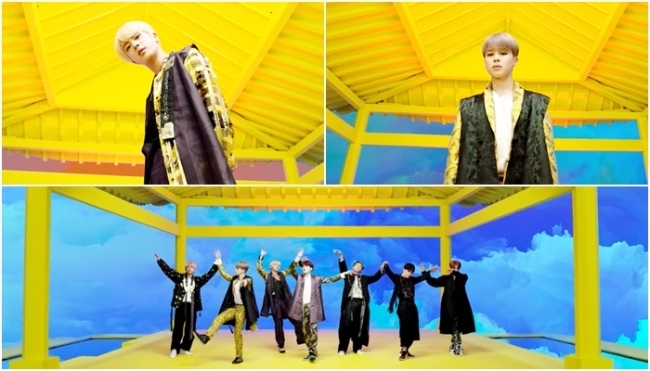 In the music video for BTS’ recent hit “Idol,” which is heavy with Korean traditional elements, the members had shown the aesthetics of hanbok to the world by dressing in stylishly modernized versions designed by famous hanbok designer Baek Oak-soo. The garments made using simple black fabric lined with fleshy gold and without including the traditional “goreum” -- the ribbon attached to the jacket. BTS recently became the first Korean pop group to address a UN session, where group leader RM made a nearly seven-minute speech at the launch of the UN’s new youth initiative Generation Unlimited during the 73rd session of the UN General Assembly in New York on Monday.